Looking for a New Lamborghini Huracan in your area? CarGurus has 28 nationwide Lamborghini Huracan dealers with 18 new car listings. The Lamborghini Huracán, introduced in 2014, acts as the Italian brand’s entry-level model. For 2019, the Huracán lineup includes four models: Drivers can choose from the traditional Coupe and Spyder convertible, as well as the high-performance Performante Coupe, added last year, and the Performante Spyder, added this year. Otherwise, the Huracán carries over for 2019. The Huracán looks imposing, thanks to its low, wide stance and svelte lines. However, the typically bright exterior colors can make this Lamborghini also look deceptively accessible. A wide, dark rear fascia provides balance and frames the quad oval exhaust tips, while staggered wheels, which are set wider in the rear, are both stylish and functional. Performante models trade out some of the Huracán’s heavier construction material in favor of more carbon fiber, which maintains strength and reduces weight. In this case, the carbon fiber is visible along the car’s exterior; it has the added benefit of enhancing styling. All Huracán models feature a 5.2-liter V10 engine and a 7-speed dual-clutch automatic transmission. Lamborghini prefers all-wheel drive, though it introduced the rear-wheel drive (RWD) option in 2017 for the Coupe and Spyder. These rear-drive models are rated for 572 horsepower and 398 pound-feet of torque. Stick with all-wheel drive (AWD) to get 602 hp and 413 lb-ft. Both Performante models, which are only available with all-wheel drive, are tuned for 631 hp and 443 lb-ft. According to the EPA, the rear-wheel drive Huracán is rated for 14 mpg city, 21 mpg highway, and 16 mpg combined. The all-wheel drive model matches city and combined ratings, but highway mpg drops to 19. The EPA has not provided fuel economy ratings for the Performante models. The cockpit of the Huracán is simple, yet upscale, offering few distractions. The driver and passenger each get a sport bucket seat (upgraded in Performante models), separated by a long center console that puts all controls within easy reach. Lamborghini provides a 12.3-inch display, push-button start, and a reversing camera to help alleviate issues with rearward visibility. Key controls are also integrated in the sport steering wheel. The dash has a functional, aerospace-inspired design with plenty of carbon fiber. Buyers with particularly deep pockets can discuss customization options with Lamborghini. The Spyder and Performante Spyder feature an electronic soft top that can be opened at speeds up to 30 mph. The infotainment system, outdated and awkward to operate, is not the Huracán’s best feature. Apple CarPlay is standard, Bluetooth and navigation are optional, and Android Auto is not available. An upgraded audio system is optional, though Lamborghini itself does not seem all that concerned about providing specifics. RWD models get 19-inch wheels and AWD models get 20-inch wheels, staggered 8.5 inches apart up front and 11 inches in back. As is typical for supercars, the Huracán has not been tested by the National Highway Traffic Safety Administration (NHTSA) or Insurance Institute for Highway Safety (IIHS). Aside from the aforementioned reversing camera, Lamborghini does not include much in the way of safety equipment, though parking sensors can be added and will probably come in handy. Though the Lamborghini Urus SUV has a similar price point to the Huracán, the Huracán is still largely considered the brand’s point of entry and enjoys a lot of visibility. Most of the Huracán lineup is currently available, and the first customers to order the new 2019 Huracán Performante Spyder can expect a summer 2018 delivery. What's your take on the 2019 Lamborghini Huracan? GuruBWW94 Don't take sharp turns on wet roads with the RWD, unless you like to fishtail and bang into other cars and maybe an unlucky pedestrian waiting to cross. Otherwise, alot of fun to drive. 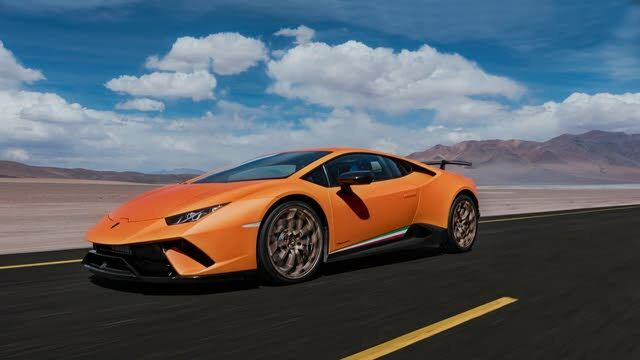 Have you driven a 2019 Lamborghini Huracan? Enter your zip to see incentives for a new Huracan in your area. CarGurus has 222 nationwide Huracan listings starting at $169,955.